Riyadh (AFP) - Latin America shows the way for Arab nations wracked by instability, United Nations chief Ban Ki-moon told a summit of leaders from the two regions Tuesday. 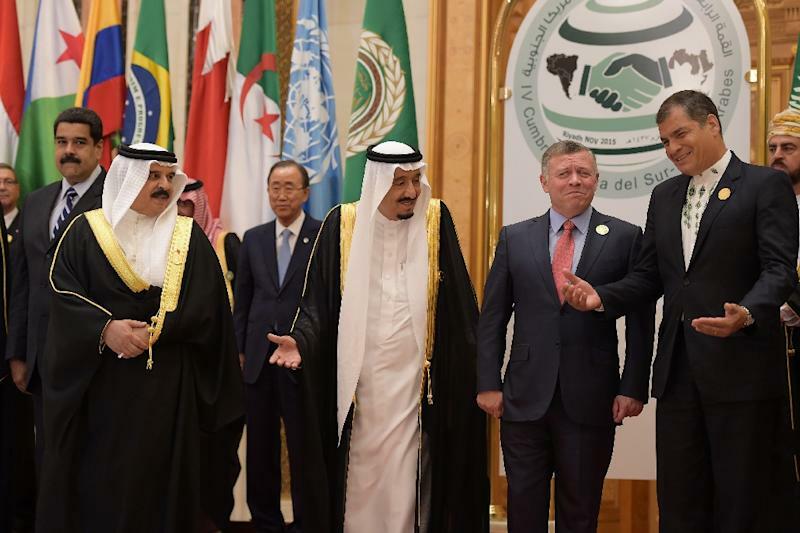 "The hopes generated by the Arab Spring have been dashed by conflict, instability and authoritarian governments from Syria to Libya and elsewhere," Ban told the opening session of the Fourth Summit of South American-Arab Countries in the Saudi capital. He was referring to the popular uprisings in the Arab world four years ago. "Latin American countries have largely made the transition that so many people across the Arab world yearn to make for themselves," Ban said. One element in that transition, not only in Latin America, has been the inclusion of community organisations as "partners of governments," he said. Ban urged a dialogue between Arab and Latin nations on how to give room to civil society groups, human rights defenders and independent media. He also said Latin America has achieved "notable gains in gender equality," particularly in parliamentary and government representation. But too many women around the world face violations of their basic rights, he said. "The world will never achieve 100 percent of its goals without 50 percent of its people as full and equal participants," he said in Saudi Arabia, the only country in the world where women are not allowed to drive. Saudi women are required to cover themselves from head to toe when outside the home, and still need permission from a male guardian to work and marry. Ban told presidents and kings from the Middle East, Africa and South America that the Arab diaspora in Latin America is the world's largest. The region's history of integration "sends a powerful message when the world is grappling with the biggest refugee crisis since the end of the Second World War." Wars and Islamic extremism in the Arab world are pushing people to flee their homelands in Syria and elsewhere. "Violent extremism is a growing threat," Ban said, announcing that he will present the UN Security Council with a plan of action to prevent radicalism next year.